Kylie on MSNBC NewsNation with Tamron Hall. Sept. 22, 2014 Thank you msg from Kylie. All donations in excess of my goal will go towards the manufacturing of the FIRST usable IV backpacks. EVERY PENNY! Kylie NEEDS funding to create a WORKING Prototype! Kylie is 11 yrs old and a cancer survivor. She designed an I.V. 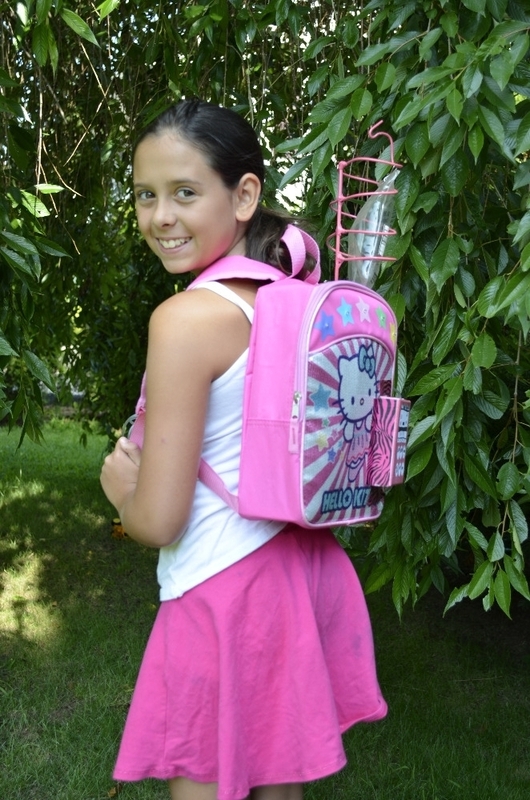 Backpack for children on chemotherapy, receiving transfusions, or other medical reasons. This year Kylie was challenged with coming up with an invention through her school and the CT Invention Convention. Kylie immediately knew what she wanted to invent. A backpack that could allow children some mobility while receiving I.V. treatments or infusions. Kylie's backpack couldn't be just any backpack. Because of the fasionista that she is, these would have to be colorful, gender specific, and awesome. She went to work and with the help from her parents designed a backpack. Kylie's invention was chosen by her middle school teachers, among others, to attend the UCONN Invention Convention where over 700 inventions were displayed and many selected for awards and recognition. 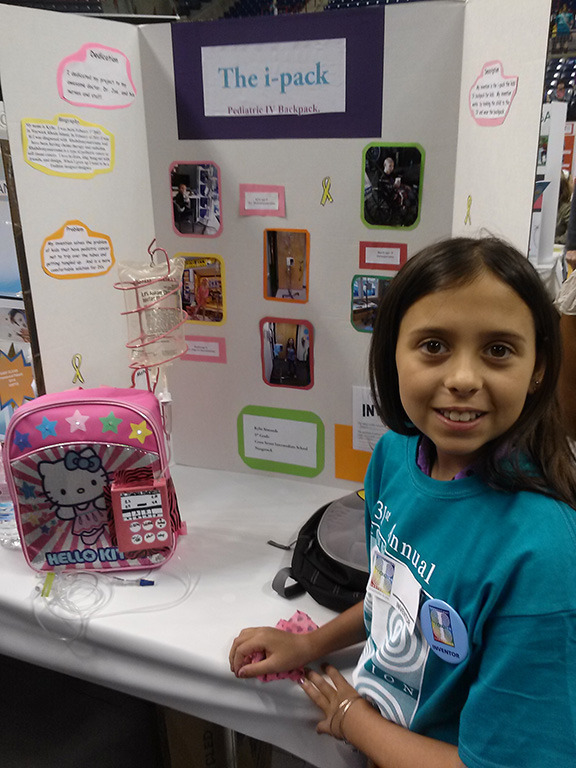 Amazingly, Kylie's invention received four awards including the "Patent Award", the highest award at the convention. The Patent Award has allowed Kylie's invention to be submitted to the US Patent & Trademark Office with the sponsor covering all costs. 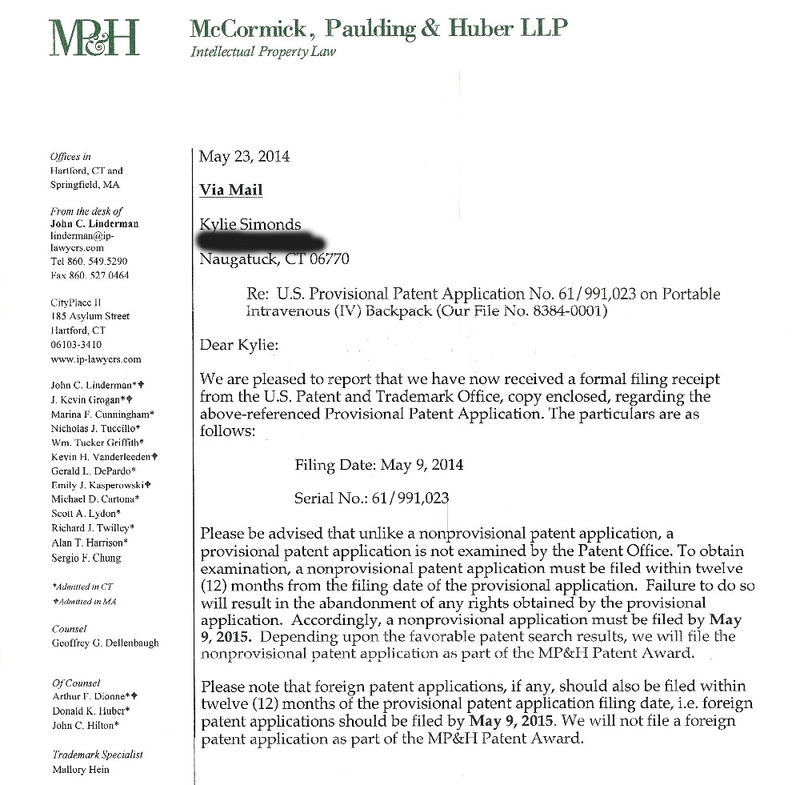 The lawyers have submitted the provisional patent application. Kylie at the UCONN Invention Convention! The design incorporated an I.V. pole with a drip bag protection cage. Kids want to move around and we can't risk the Medicine bags getting punctured or compressed. This cage is customizable with different shapes, like hearts, peace signs, etc. This also makes treatment less scary like current I.V. poles which are very intimidating to young children. The protection cage is also removable and can be replaced with a child's choice of design. If they receive two different medicines or a transfusion and medicine they can add a second cage. The backpack also has the I.V. controller built into the bag to control the flow rate. It is powered by battery which most I.V. machines on a pole are also battery operated. Raise funds to build a prototype. With help from her father, Kylie is now doing R&D to make the prototype. She has found numerous infusion pumps that will suit this idea but the cost for them is in the thousands of dollar range. 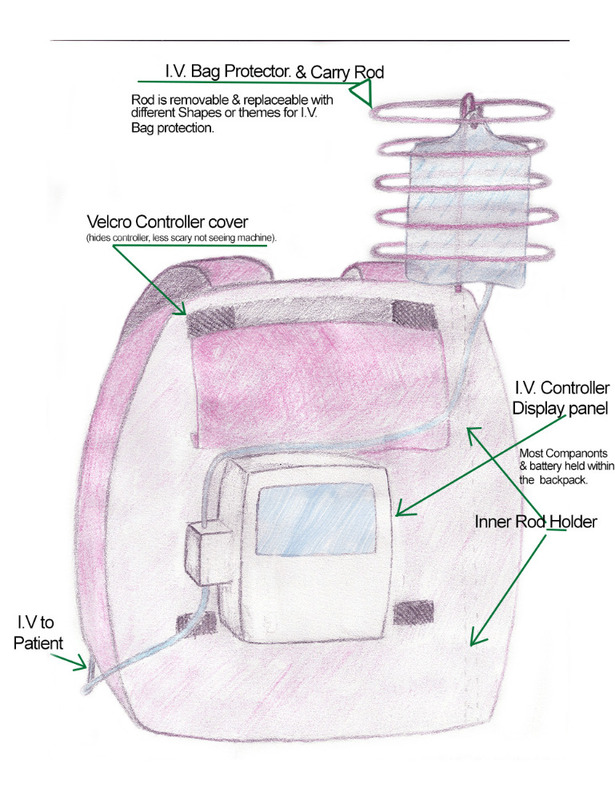 Additionally, the backpack will need to be designed to support both the IV infusion pump and the carry rod. Create a truely working prototype. Then market the first complete prototype through media outlets to slolicit interest. Begin production of a boy and girl line of the backpack. Incorporate animal features into the design to make them fun for young children. Begin researching designs for a backpack line for teens/young adults. Kylie is determined to make this a reality and see the I.V. backpack in children's hospitals throughout the U.S., maybe throughout the world. 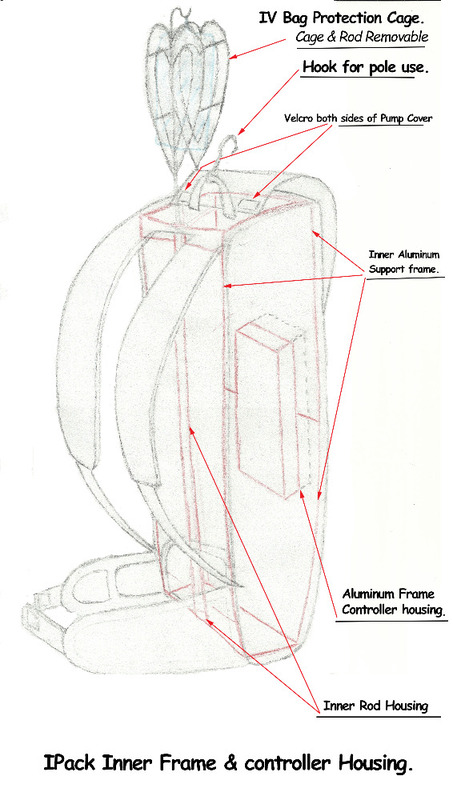 Unfortunately, it requires an enormous amount of money to make a prototype of this backpack. The controller will need to be customized to be mobile and also small enough to fit in a backpack. So Kylie needs your help to make this a reality. Please help Kylie reach her goal. You can learn more about Kylie on Facebook if you search for "Courage For Kylie", her facebook page for support while she was receiving treatment. This is Brooke from Brooke's Blossems. With a backpack she wouldn't need an I.V. pole to visit build a bear. 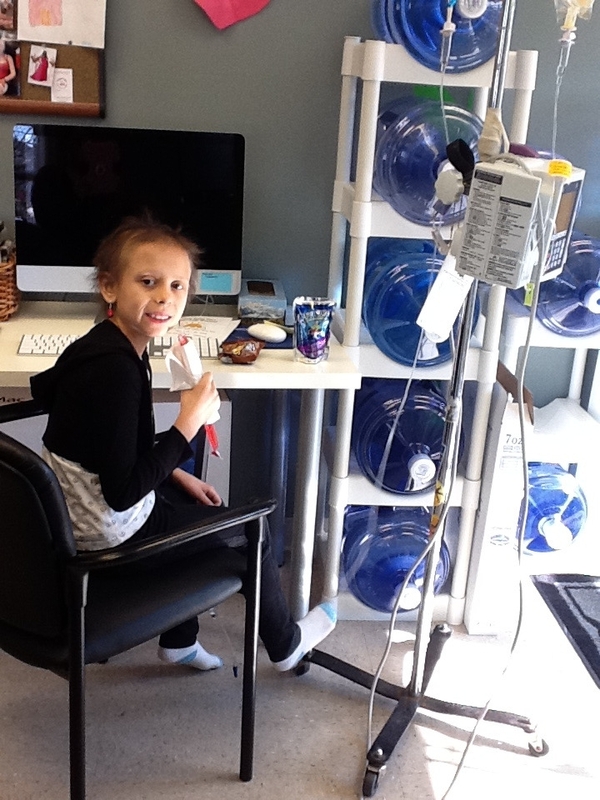 This is Kylie during treatment. Once again an ugly I.V. pole. For anyone interested, this is her website we set up for her while she was receiving treatment for support. A journal of her journey can be found at the link to her Caring Page. 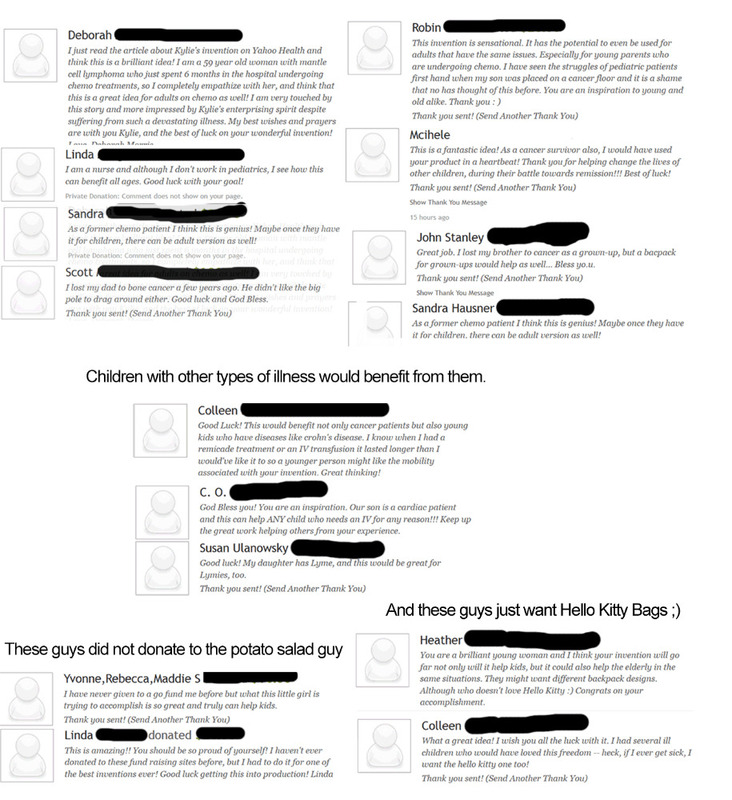 Yes, we read and reply to all the comments left by those who donate. These are only a small selected group. We've learned a lot from reading your comments. 1. 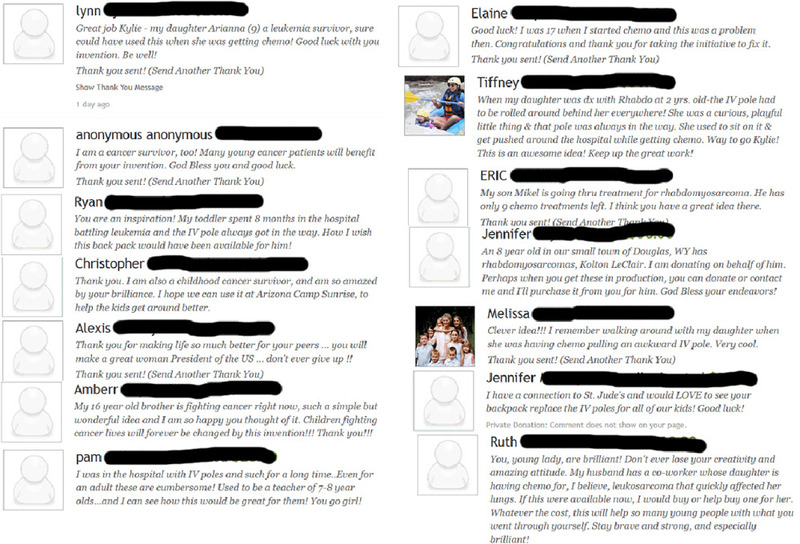 Their are way too many children being diagnosed with cancer. 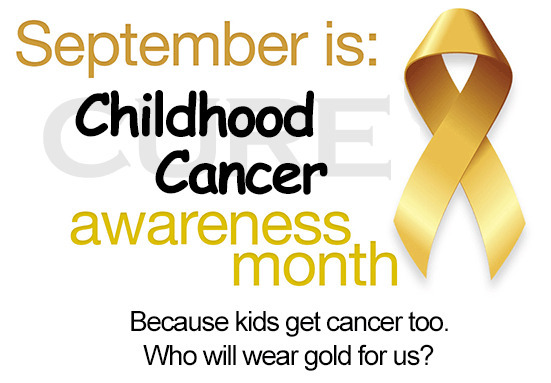 The occurance of cancer in children has increased steadily for the past 30 yrs. 2. You guys really need to stop goofing off at work. 3. These backpacks ARE needed! Adult patients would benefit from them. Hi this is Kylie thank you so much for the support. I haven't posted an update in a while but we paid for 3D designs and had it 3D printed. The design would have costed too much money, and are a little more complicated than we want them to be. We are now having to go back to the drawing board but we will post some pictures of the 3D prints and we will have an update soon! 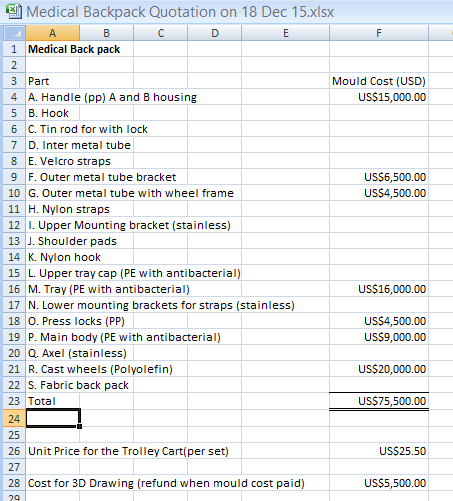 Cost is due mostly to the 7 different molds that need to be made. We really really need to at least see one of these backpacks in person instead of just on paper before we invest every penny Kylie has raised, just to find out that certain pieces dont work and then we have to pay $20,000 or more for just one new mold. So we are thinking we need to have one 3D printed first. I am so sad we have put so much effort into this project and have come so far and now we still dont' have the money we need. All we want is to help Kylie make her vision come to life and help SO many kids who could benefit from her product! So please share this post and Kylies page maybe someone out there can help us out. We are SOOOOO close!!! Hi everyone just wanted to let you all know we are getting closer!! 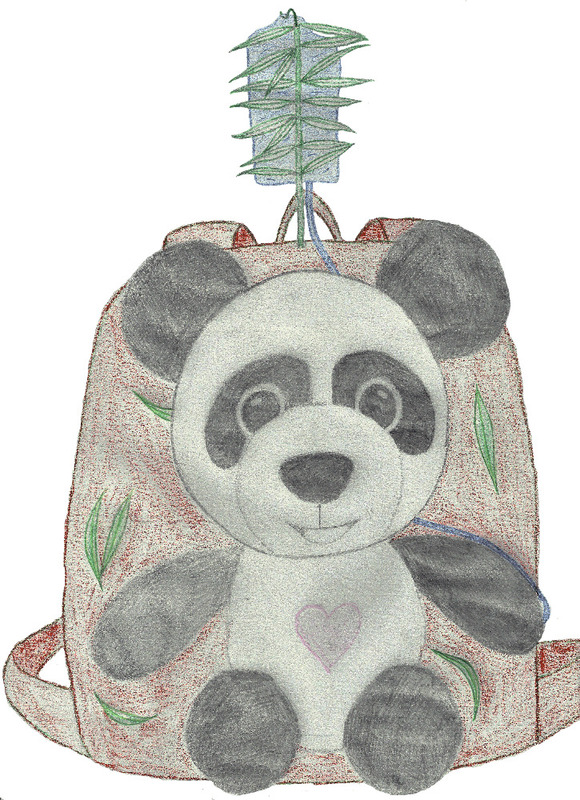 We have seen the designs of the backpack from the designer at PillowPets. They are awsome!! There are few tweeks we need to do then designs will be sent to the production company and we will have a working prototype in about a month. We are all SO excited to actually have one in our hands to show everyone. Now we just need to try to raise some more money to get these manufactured. Thank You for all of your support up to this point. Soon we will be able to get these to kids who need them! Hi y'all !! Just an update. 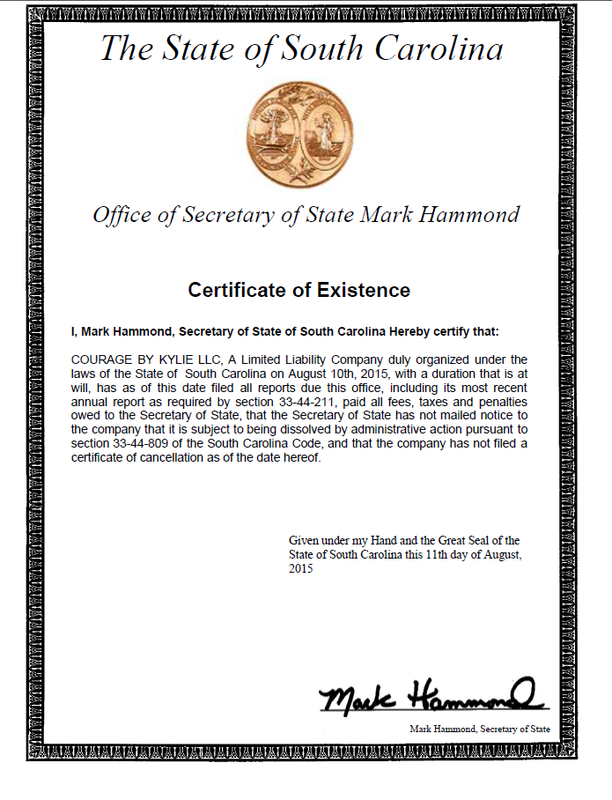 We are very excited we are now an offical business Courage By Kylie LLC. We are working with an amazing company, you may have heard of them Pillow Pets. Their designers are starting to work on the prototype as I write this. HOW EXCITING!! Once this prototype is made we will make some tweaks and get a final one made. Once we reach that step we will get set to manufacture the bags. Only thing holding us back is money. Who knew it would be so expensive and that their would be a minimum order of 3000 per design. So again we are asking for your support, we have raised the goal here. So please donate, share, tweet whatever you can to help. We are SO close to finally making this a reality. Kylies dream will come true to help other children fighting cancer and many other diseases! So please help! Once again thank you all so much for your support to this point. When people work together anything is possible!! Hi there I just want to say, don't give up. This is an amazing idea! Keep sharing this on social media and with celebrities. I only ran across this because I was doing research on kids with cancer, it's something I want to help with once my business is up and running. finally a inventor from connecticut keep up the good work! You are so amazing my 16 yr old brother at the time 15 just kicked stage 3 melanoma in the chest and after 3 weeks of treatment of 5 rounds of chemo and 2 lymph node surgeries he was back on the football as a starting linemen people like you are such an inspiration and you my angel are the only person i have ever funded because this touched close to home and you are one amazing person never ever forget that through this invention you will have touched so many children that are fighting every day to find a way to be normal and just be able play like every other child, good luck sweetie!!! What an amazing idea from an amazing young lady. Have you tried going on Shark Tank? 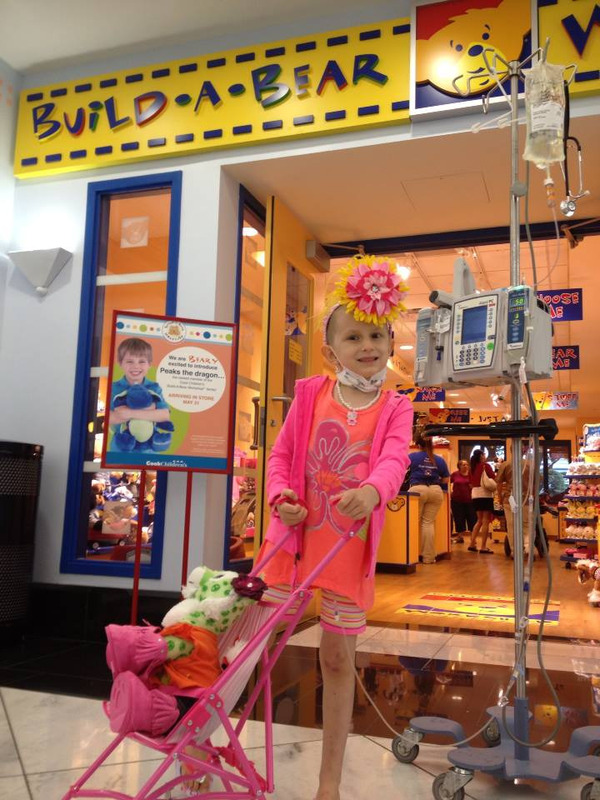 What an awesome and very brave little girl. Way to go Kylie I hope you reach your funding goal and see this become a reality. It is very sad why you want to make this as I wish no child had to go through cancer treatment but at the same time it is very happy to think this could give kids more freedom during treatment. Keep up the good work. 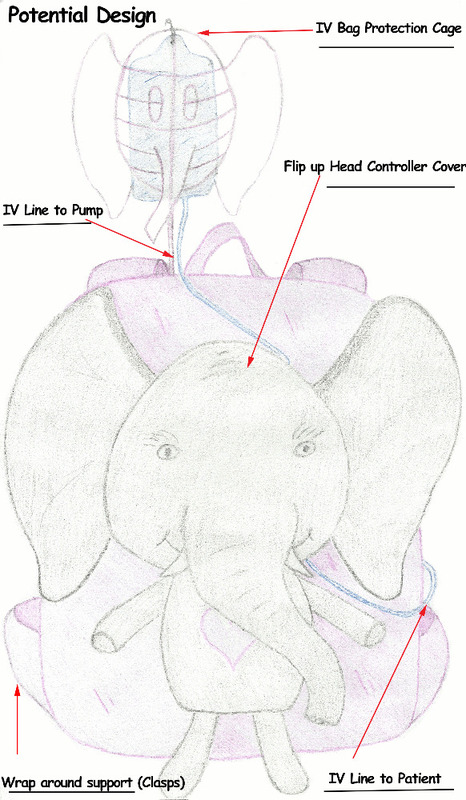 Could this be modified for those who require tube feedings? Wonderful idea! Love the idea of your kid friendly designs on backpacks! 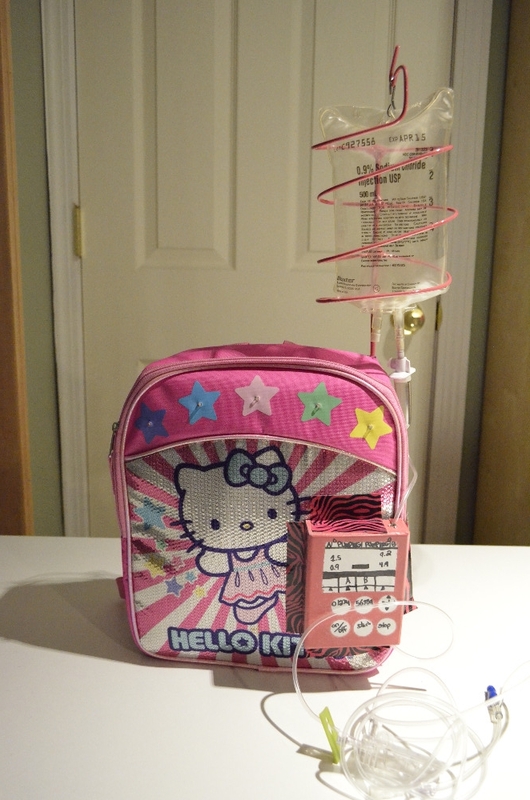 !You may want to incorporate already available ambulatory infusion pumps (for example Wolf-Pak® 3 Liter Back Pack Pump Pouch) to eliminate the need for the IV bag holder/pole (then you would eliminate the risk of air entering the system if the bag gets tipped with active kids??) . Good Luck! This is a beautiful idea and as a cancer patient myself I would love to see something like this invented so you aren't stuck having to lug around a large iv pump and pole. Wishing you continued good health and success in making this a reality. Way to Go! 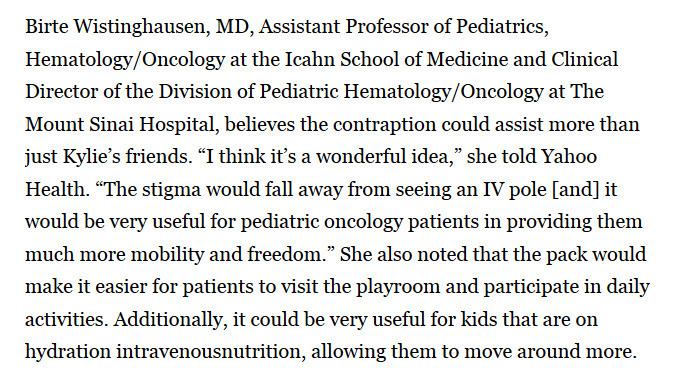 Awesome idea, it will bring so much more independence to patients so they do have to drag that pole around with them in crowded places and eliminate people starring and wondering what's wrong with these beautiful children. I'm to poor to donate right now but wish I could to the cause. You will bring many smiles to so many children. I hope you continue to stay healthy. I'm proud to be able to help out such a fantastic idea by a smart young girl! Good luck! What a clever idea! This will make life with chemo so much better for kids and adults as well. You are awesome! Such an important idea whose time has come. Signed original sketch of Prototype. Backpack donated to a children's hospital in your honor. Shout out video by Kylie to all Bronze supporters. Every donations help Kylie reach her goal! Every donation helps Kylie reach her goal! You are helping make a brighter future for many kids!